Once you got your initial free 22GB, you can earn an additional 5GB of cloud storage for everybody else you invite to Copy. Just keep spreading the word, because for a limited time, Copy is handing out extra space for every new signup. Both for the new person who signed up, and for the person who referred the new member. This is how I got my first extra 5GB – thanks to the wonderful Mr. Pete Brown from @iLearnDifferent. Pete also happens to share great information on twitter, so please check him out. Is Copy’s cloud better than Dropbox or Google Drive? Now that you have all that free cloud storage space, is it any good? Yes it is. Obviously Dropbox and Google Drive have something of a lead when it comes to how many apps have integrated these cloud storage services, but Copy comes with a couple of features that make me think that it will catch up soon. First of all, Copy offers a lot more free space right from the start. Dropbox&apos;s 2GB and even Google Drive&apos;s 5GB look dwarfish next to Copy&apos;s 15GB or, if you read this in time to benefit from its referral promotion, 20GB of free space. And if you are running out of space, becoming a paying customer with Copy is a much better value than Dropbox or Google Drive. For $10 per month, Copy gives you 250GB. At Google Drive, the same money only buys you only 200GB, and Dropbox tails the list with only 100GB. Another important issue in which Copy excels is its "Fair Storage" feature. Instead of counting data in shared folders against all members’ individual storage quotas, Copy allows users to “split the bill” and control which files count against their cloud storage capacity. As a result, other people&apos;s files won&apos;t eat away from your free storage, and vice versa. What does it mean? You can finally share images from your last vacation totally guilt free. Other great features include easy file sharing options, versioning / history of files, and having more than one email associated with your account. Especially the versioning control is priceless! While writing a journal article, you can go back and open a previous draft and recover that one paragraph you kicked out because it didn&apos;t seem to fit. In short: Copy is packed with features and looks very promising. Copy has a very clean web interface that lets you easily browse your files. You drill down through the file structure via multiple planes, and it is very easy to find your way around. Do you like academiPad? Check out our facebook page to show your love and to participate in our community. Unfortunately, I haven&apos;t found a way yet to change the file structure from within the web interface. I hope that this feature will be added soon. For me, a cloud storage service must be tightly integrated with my other devices – otherwise I am not even bothering signing up. Luckily, Copy supplies you with apps for Mac/PC/Linux and your mobile devices (iOS and Android) that let you access your files seamlessly without the web interface. Like Dropbox, Copy does a fantastic job of integrating the cloud into your local machine. On your Mac, you can access your files on the Copy cloud in the Finder. And via the context menu, you can look up a file&apos;s history and share it publicly or privately. Last, you can re-arrange the file structure, as you would of course expect from any other folder on your Mac. On iPhone and iPad, you can do exactly the same. In addition, the mobile app offers you quick access to recently modified files to help you staying on top of your files. This is a really great feature when you are sharing article drafts with a co-author! When you use the Product, you agree that Copy may duplicate and store your data, information, files and folders in accordance with Copy’s policies and these Terms. As between You and Copy, all information You provide to Copy remains your property. However, take note that while a cloud storage service offers you some security against loss of data when your computer crashes, Copy is not a backup service (but neither is Dropbox or Google Drive). You are responsible for maintaining and protecting your data in Copy and Copy is not responsible for any loss or corruption to your files or information or for backing up such information. In most cases, your data should be safe when being stored on a cloud server. However, cloud services do not assume responsibility for your data unless they operate as an explicit cloud back-up service such as SugarSync or CrashPlan. You can read more about securing against a crash here. Copy is the new kid on the cloud storage block, and this is your chance of cashing in big time. Its feature set is very convincing, and you won&apos;t regret signing up for the free 22GB. And once you start, why would you stop? Share your own sign-up link with friends and family to get even more space. Because Copy is so new, hardly anybody has signed up yet – and who turns down a free cloud storage drive that is larger than the storage on most people&apos;s phones!? But act fast, because the extra 5GB promotion is running only for a limited time. 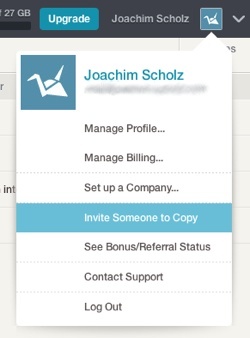 In order to share a sign-up link with other people, just click on your name in the right upper corner in Copy&apos;s web interface and select "Invite someone to copy". It really works: I am with Dropbox for five years now, and through various tricks and conincidences I manage to rack up 23.2GB of free space. I know about Copy for roughly five hours, and I already accumulated 27GB – for free, forever. Actually, there is a fourth step now: Create your own referral link and share the good news. Happy cloud storage partying! I am using COPY and am satisfied. I would like to ensure that my client(s) have access to the uploaded data as well. I cannot figure out how to invite them to access the account I have created and am using.